Beauty is a pain, and women have to come to terms with it. Botox is expensive and not for everyone. But what if we can have something that proves both of these statements wrong? Microcurrent facial is your answer. No, it is not just another coming-of-age anti-aging technology aggressively making rounds in the cosmetic industry. It is surprising to find out that this was first used in the early 1800s, but for different reasons. With time, aestheticians and the cosmetology industry recognized its benefits – which is how it found its way into high-end spas, salons, and cosmetic clinics. What happens in the session? Is it painless? Is it affordable? Is it advisable? We know there are a lot of questions around this, so let us break it all down for you. What Are The Benefits Of Microcurrent Facial? How Is Microcurrent Facial Done? 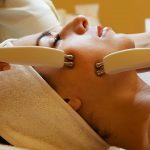 How Much Does Microcurrent Facial Cost? A microcurrent facial is a natural face lifting procedure that gives you great results without you having to go under the knife or looking unnaturally botched up. It is a painless treatment that tones your facial muscles – in a way similar to how physical exercise works on your body. Experts say this procedure boosts collagen production by an average of 14%, elastin by 48%, and blood circulation by 48%. Microcurrent facial mimics the bioelectrical currents of your body to increase the cellular activity – and this slows down the aging process. The intensity of the current waves is so minuscule that it probably takes more than a million such machines even to light one bulb. It emits extremely low-intensity current waves that cause a slight tingling sensation. Along with the mechanical procedure, it also uses LED light therapy that stimulates the production of collagen and elastin – tightening your skin and making it wrinkle-free and youthful. Improves Skin Texture – It improves the overall texture of your skin because it acts as a toning technique for the face and neck. Defines The Jawline – Your jawline gets chiseled and well defined because it lifts your jowls. It also visibly lifts your eyebrows. Delaying Signs Of Premature Aging – It works on your fine lines, crow’s feet, and wrinkles. Microcurrent facial is one of the most effective anti-aging treatments. Improves Blood Circulation – It leaves you with a radiant and luminous glow because it improves blood circulation. Helps In Lymphatic Drainage – It acts as a detox procedure to flush out toxins through increased lymphatic drainage. Increases Skin Permeability – It flushes out toxins and clears out your skin, improving the penetration of topical application and products that, in turn, improve your skin’s health. Reduces Acne – It works on all types of acne and is safe for all skin types. You should see a visible reduction in your acne and scars in just a few sessions. Exfoliates Your Skin And Reduces Pore Size – It is a gentle abrasive technique that exfoliates your skin, removes dead skin cells, and clears clogged pores – ultimately leaving the skin supple. Melasma Treatment – It reduces discoloration, pigmentation, and other issues with an uneven skin tone that are caused by suntan or melasma. Let’s now take a look at the procedure. The procedure is a series of the following steps and takes about an hour. This is after the consultation that is important to assess your skin tone, texture, concerns, type, etc. Cleansing – If you have makeup on, the aesthetician first cleanses your face thoroughly before the actual procedure. Even if you go without makeup, basic cleanup is required to ensure your skin is as clear as possible. The cleanup also prevents the dust on skin surface from going deeper. Skin Analysis – Your skin will be analyzed under magnifying lamps. This helps the expert understand what exactly you need. Hot Steam – Just like your regular facials, your face is first exposed to steam to open your pores, soften them, and make the exfoliation process more effective. Exfoliation – The exfoliation that happens here is more intense; dead skin cells are totally removed (unlike your regular scrubbing at home). The procedure is mechanical and uses chemical products that contain enzymes, and acids that remove dead cells, blackheads, whiteheads, etc. Dead skin cells cause pigmentation, clogged pores, acne, dullness, and most other skin problems we face – which is why this step is crucial. Massage – This is the massage with the tongs that stimulates and relaxes your facial muscles. This is the most essential step in the procedure because the aesthetician who is trained and certified focuses on the parts of your skin that need to be addressed. Mask – Just like any other facial, the procedure ends with a facial mask or a peel specific for your skin type to enhance the effects of the facial. Final Steps – After cleansing the mask fully, the procedure ends with the application of toners, serums, and lotions. 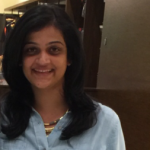 Follow-Up – It ends with instructions on the follow-up and maintenance you need at home. Microcurrent treatments start from a minimum of $200 for one session. But the rates can go up depending on the salon you choose, and the severity of your skin concern, if any. Most dermatology clinics offer packages, which start at about $800. Microcurrent facials are not a cheap deal, but they are sure worth it. Our parents or grandparents probably didn’t need these, and even if they did, it was relatively much later in their lives. Now the times have changed. We are aging twice as faster because of our lifestyle and environmental factors. So, I guess we have a lot to be grateful for – the ease of technology and the access to it. 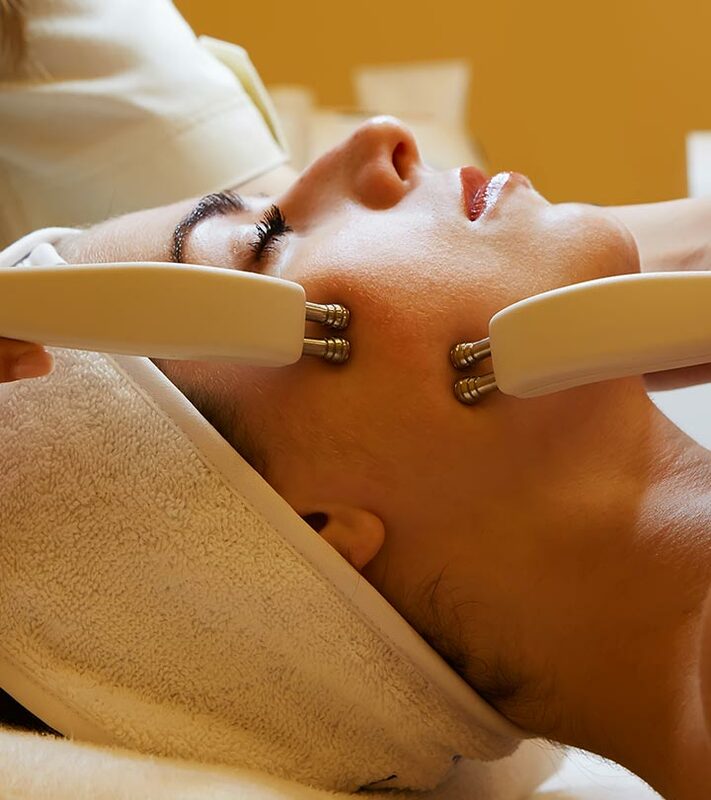 Have you heard of microcurrent facial? Are you considering getting it done? Do you have any questions? Let us know by dropping in a message in the comments section below. Each session takes about 50 minutes. The results last for about 4-6 weeks, and you need to go back for maintenance if you want to make it a permanent skincare routine. Each clinic or aesthetician has a different schedule for different people based on their skin type and problems. You have packages, stand-alone facial sessions, etc. and all of this depends on your time, budget, and personal preferences. What is a microcurrent non-surgical facelift? Microcurrent facial is popularly known as a facelift procedure, but without you having to go under the knife or surgery. The results are so remarkable and vivid that people who cannot afford, do not prefer, or don’t want to choose a facelift procedure can get just as close results with the fraction of the cost, time, and practically no pain.